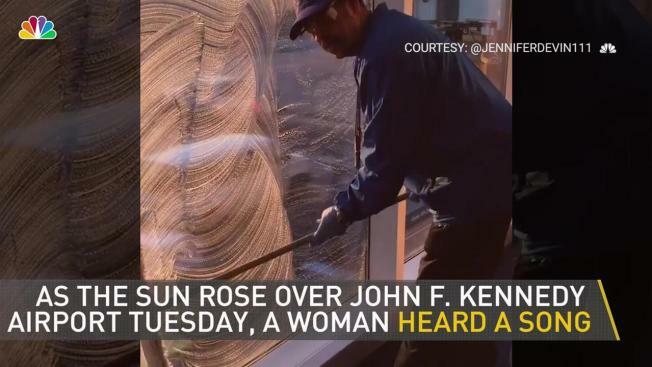 A woman was waiting at JFK Tuesday morning when she spotted this talented man cleaning the window. Talent is never far away in New York City. As the sun came up over the John F. Kennedy International Airport tarmac on Tuesday morning, traveler Jennifer Harrison heard a sound. It was singing, and it was coming from the gentleman washing the inside of the windows. As he soaped the window and washed it down, he sung a delightful little tune. "I had to take a video of him," Harrison said. "It was so beautiful. The gentleman cleaning the window was so full of joy." As a travel announcement comes over the PA system, the man continues to sing, at one point hitting a stunning high note which he holds for seconds. When Harrison showed the video to him afterwards she said he commented, “I’m so happy to be working.” She said she now hopes the multi-talented man will be identified and discovered, perhaps even earning himself a place on the "Ellen" show. Watch the full clip above.